We are a leading service provider for the Diamond Jewellery Certification. We are recognized for its top-grade services in Diamond Jewellery Certification. We furnish legitimate certificate and report to our client with our services, which creates great trust among our clients. Our End Clients / Customers certificate is a authorization, which is given to our clients for their long relationship. 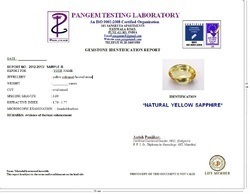 Our End Clients / Customers certificate displays correct reference for clients and their Jewellery. Looking for Diamond Jewellery Certification ?